Scientists, public health experts, food producers and consumers have united to generate research on functional food that allows the public to lessen pharmaceutical side effects and surgical costs in the treatment of serious illness. This book presents not only innovative functional food ideas for managing chronic illnesses, but also the processes and scientific research which lead to these modern yet time-honored treatment methods. This issue not only preserves some of the wealth of contributions made in the field, but lays the foundation for a field of science that promises to expand in coming years, potentially changing modern society’s relationship with medicine. This cornerstone guide, written by internationally-recognized functional, medical, and bioactive food experts, covers the basics of functional food science. With more than 1,000 scientific references, this book provides scientists, medical doctors, nutritionists, food technologists, and students majoring in biology, nutrigenetic, and food science fields, as well as public health professionals with a comprehensive and up-to-date examination of functional foods. Basic Principles of Functional Food Science provides modern information on functional food components, including antioxidants, dietary fibers, prebiotics, plant sterols, bioactive peptides, and flavonoids, and many other phytochemicals. This text presents some of the latest developments in nutrigenomics, molecular biology, and epidemiology, as well as the production, marketing, and distribution of functional foods. In this textbook, our editorial board has included additional information and resources in order to enhance the learning experience of our readers. These additions include detailed editing of articles, new figures, tables, and pictures, end of chapter summaries for each chapter, test questions at the end of each chapter, and an updated glossary with new key words. There are many new words in our glossary at the end of the textbook. These words can be found using the page numbers associated with them in order to find the chapter that contains them. These words have each been conveniently highlighted in the chapters so they may be easily located. It is to the readers’ benefit to review these words in the glossary so that they may better understand the material in the chapters. The book is collective work of 15 scientists, 9 universities, and other medical and food organizations across the globe. 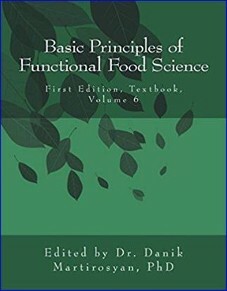 In the face of growing support and differentiation of this field, we wanted to recommend the sixth edition of the Functional Food Textbook: Basic Principles of Functional Food Science. We believe it will enrich the university classroom and the future of functional food learning. If you are interested in obtaining copies of our textbook at a discount, email us at ffc_usa@sbcglobal.net! Also, explore our website at: www.functionalfoodcenter.net.